Last summer, while I was enjoying a cup of coffee with friends, someone mentioned seeing a lady’s kroj in a yard sale. I was sure he was mistaken, because I knew how special a kroj was to the woman who made it. Later that afternoon, I remembered our discussion and went looking for the purported kroj. After driving around the area, my wife and I found the yard sale near St John Lutheran Church. Sitting under a large tree, were three ladies who were trying to clean out their recently deceased mother’s home and dispose of her property. “And what are you asking for the ensemble?” I asked. Knowing how special the kroj had been to the deceased mother, I asked if they were sure that this was an acceptable price. They all agreed, saying that they had no use for the outfit and that, if I didn’t buy it, they would probably discard it or give it to the Salvation Army. 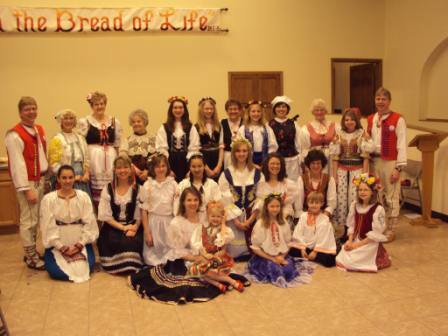 We thanked the ladies, rescued their mother’s kroj and added it to my wife’s collection. Unfortunately, these unappreciated heirlooms often end up at yard sales and auctions, and a new generation unknowingly loses a part of their family heritage. 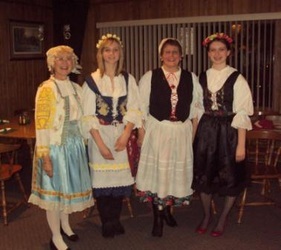 Last year, the Phillips, Wisconsin Czech-Slovak Festival’s theme was Grandmother’s Kroj,so we continue to ask members of the community to check their attics and closets for their parent’s or grandparent’s kroje and rescue them for future generations.